I read a blog about cutting all carbs and only eating protein and vegetables…well what do you eat with only those options? I learned that carbs (for me) are very important because I need the energy to get going. But as you know me, I’m a woman of convenience…so I need something fast, fast! 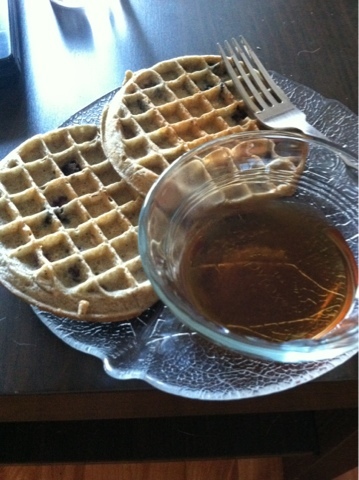 I decided to try Kashi Whole Grain Blueberry Waffles…and my oh my was I excited! Pop these frozen waffles into the toaster for 10 minutes, add some sugar free maple syrup and you have a 170 calorie breakfast which allows you to add fruit as a side! The waffles are delicious and the blueberries are spread evenly throughout the waffle- perfect!! Previous Post Plateau… is a good thing?